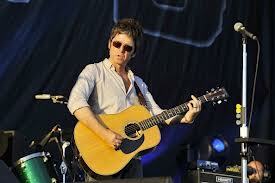 At V Festival 2012, Noel Gallagher’s performance was epic! He began his set by dedicating his Oasis track ‘Supersonic’ to double Olympic gold medallist Mo Farah. His set was packed with material from his debut solo album, along with classic Oasis tracks – Gallagher astounded his Essex-based audience on the Virgin Media stage in Chelmsford. Prior to playing the classic song’s acoustic version ‘Supersonic’, Noel dedicated it to Olympic 2012 10,000m and 5,000m champion Mo Farah and in response received an overjoyed applause from an ever-so enthusiastic crowd. Some of the cheekier crowd members were overheard chanting “Where’s Liam? Where’s Liam?” To which Noel’s response was… “Where’s Ian? He’s backstage” Referring to The Stone Roses main-man. The legendary Manchester band was the closing act for the first day of Hyland Park’s Festival – a remarkable set that lasted 90 minutes. Arriving on stage in a spectacular jacket – Ian Brown’s unique and specially designed windbreaker jacket was adorned with artwork from the band’s 1st album. “Do you like me Jacket?” was the question Ian asked his audience before launching into “I Wanna Be Adored”. The band played every song from their legendary 1989 debut album, except ‘Bye Bye Badman’ as well as many of their other classics, such as ‘Fools Gold’, ‘Ten Storey Love Song’, ‘Sally Cinnamon’ and many more. Their performance ended with a superb firework display as ‘I Am the Resurrection’ came to a remarkable close. This entry was posted on Saturday, August 18th, 2012 at 11:32 pm	and is filed under Music News. You can follow any responses to this entry through the RSS 2.0 feed. Both comments and pings are currently closed.